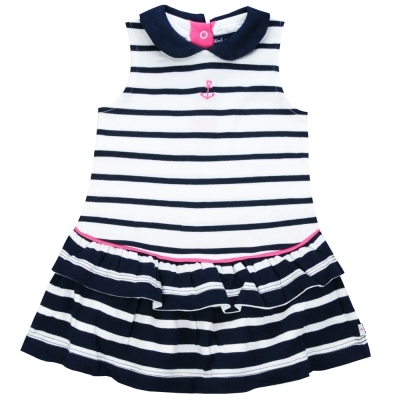 Navy-striped white dress, with short sleeves, for baby girl. This dress is very original thanks to the navy-dotted white flounce, separated from of the upper part by a pink elasticated strip. 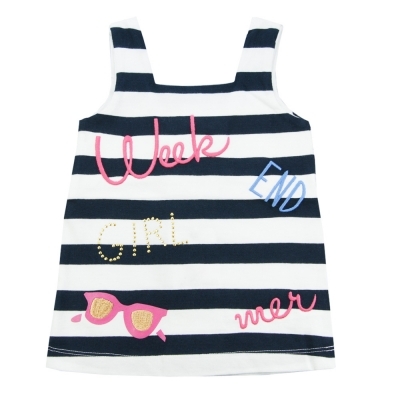 Navy-striped white sleeveless dress, for baby girl. The upper part of the model is white with navy stripes, whereas the flounce is sprinkled by lovely multicolor flowers. The back is slightly indented, enhanced by a cute bow. Little sleeveless dress, for baby girl. The upper part of the dress is white with navy stripes while the flounce has inverted colors. These two parts are separated by a thin pink strip. We note its lovely navy claudine collar and its pink anchor embroidered on the chest. 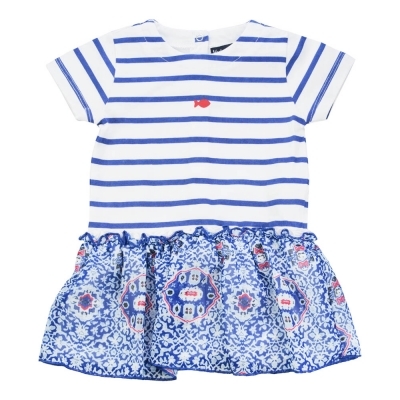 Original, this nautical dress will highly appeal to you litlle princess ! Blue-striped white sleeveless dress, for baby girl. The upper part of the dress is made in a plain pink yoke. We note its necklace patterns made in prints and embroideries, that bring a very girly touch to the model ! 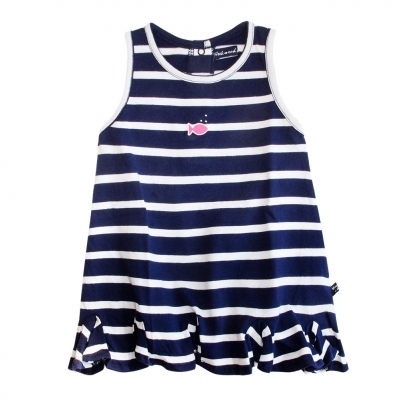 White-striped navy sleeveless dress, for baby girl. It distinguishes itself thanks to its very cute frufru flounce ! 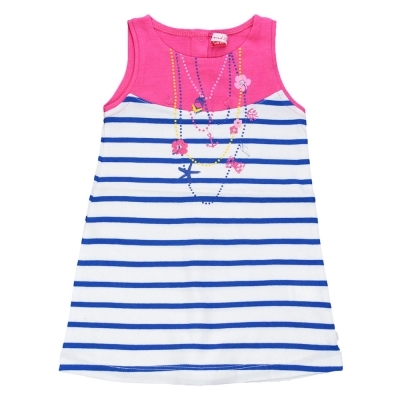 Navy-striped white sleeveless dress, for baby girl. We note its very original flounce that ascend along the body, and bring a very elegant touch to this dress ! Sleeveless dress with thin blue and white stripes, for baby girl. We note its blue-dotted white long flounce, separated from the upper part by a blue elasticated strip, topped by a lovely blue bow. Sleeveless dress with large navy and white stripes, for baby girl. We note its lovely inscriptions on the front, and its box pleat in the back, topped by a cute pink bow. 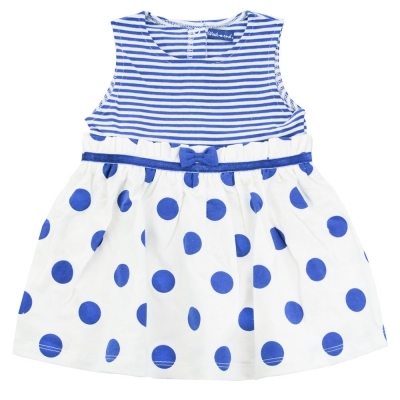 Blue-striped white dress, with short sleeves, for baby girl. This dress is very original thanks to its veil flounce with blue patterns. Set composed by a blue-striped white tunic, and plain blue leggings, for baby girl. The tunic has a superb hearts pattern embroidered on the front and underlined by a Week-end à la Mer inscription. We also note its little fantasy sleeves that bring a very lovely touch to the model ! Set composed by a white and navy striped dress and a plain bue cardigan, for baby girl. The dress has a decorative button placket under the collar and lovely fantasy straps. The particularity of the model : its triple flounce that bring a very girly touch to the dress. The cardigan, him, has a button on the collar and a white fish embroidered on the chest.